Sometimes I get an e-mail forwarded to me by an excited friend, but they don't realize how old it is and that it made the rounds years ago. I hope this is not one of those situations for you. My sister sent me an e-mail months ago with some suggestions on how to be a better writer. There were originally over 30 but I'm just passing on some of my favorites. In case you are the person who wrote this and in case you also happen to be a lawyer, I'm not taking credit for these, but I don't know the source to give credit to. That being said I think these are some practical writing tips that we could all benefit from. Avoid cliches like plague. (They're old hat). Don't get mad at me over these, I'm just the messenger. I'm also just as guilty of regularly violating these rules as the next guy. I remember the first time I came across videos from The Onion News Network on Youtube. At first I thought they were real news stories and apparently so did most of the people leaving comments. I can't blame viewers for being confused. They do such an excellent job of mimicking CNN and other media outlets with their formulaic stories and reporting. I was recently catching up on some of these and thought I'd include some of my favorites here. These clips are all so well done that if you are not paying close attention they would pass for actual news stories. They are geniuses. I hesitate to promote all their pieces since some of them are inappropriate but for the most part I enjoy them. I'm sick of the usual barrage of insulting news and media so watching their brutal satire is therapeutic for me. I find few things funnier than the straight faced reporting these guys do. I just finished writing this post and thought I had copied and pasted it to today's date, so I went ahead and deleted the old version. Oops. I wish blogger had an edit and undo button. In case they do, don't tell me or I will feel like an even bigger idiot. The most painful part about deleting this post was having to re-type the sensitive subject matter. Several years ago when times got hard I decided to donate plasma. Donating plasma is not the kind of thing you brag to your friends and neighbors about. There is a certain social stigma that accompanies this practice. It's definitely not the most prestigious way to earn money. I knew plasma was used for a variety of good causes like treating burn victims, helping people with clotting disorders, and making snack foods for vampires, but I still felt like I was prostituting myself for money. The facility I went to was kind of old and run down and sometimes it felt more like a homeless shelter than a medical facility. It was a depressing environment so I only ended up donating for about 3 months. Recently I decided to start donating again. It's not that I need the money, I just do it because I am just so bored. I was unable to get into the old place I used to go because they were so busy but I found another facility. This one was new and clean and had a professional staff. The donors were even normal people. They used sterile equipment, played movies while you donated, and they even gave you Powerade and money after. Sounds pretty sweet doesn't it? I have been donating now for several months. I was recently told that one of the side effects of regular donations is the build up of scar tissue on your skin where the needle is inserted. The phlebotomist who pointed this out to me tried to assure me that it isn't really that bad. She said she was a regular donor for years and she just had a small scar. She showed me her arm and I tried not to scream like a girl as I gazed into an enormous hole that looked like the sarlacc pit that Jabba the Hut tried to drop Luke into in Return of the Jedi. I'm still trying to figure out how to replace plasma money with blogging money but it is a very slow process. I would appreciate ideas from any of you professional bloggers who may have actually figured out how to make money while doing something you love. Until then I will continue to sell my body for money. Over the last several weeks I have encountered several computer problems. I usually lag behind the general public a good 5-10 years when it comes to computer equipment. My computers are not quite as old as the PET computer to the right, but they are not far behind. Challenge #1-The power cord to my laptop developed a severe short and I am now required to to hold the cord firmly in the port with my right hand in order to provide power to the computer. As a result I am often forced to type with just my left hand. This is not a recipe for fast typing. I recently went to Radio Shack for a replacement and they didn't have a compatible adapter, but they did show me a $100 universal charger/adapter that would work with anything. Maybe I'm too cheap, stubborn, or stupid, but I'm not willing to pay $100 to fix the short. Challenge# 2-With the laptop now threatening to power down at any moment I have been relying on our regular PC but my wife just bought an ergonomic keyboard for it last week. And by ergonomic I mean you might as well rearrange all the keys on the keyboard. I've seem ergonomic before but this is extreme. It feels like someone randomly glued Legos all over the keyboard. I am still faster with one hand on the laptop. At least if I get carpal tunnel syndrome it will only be in one hand. Challenge #3- My wife has been working on medical transcription work and also installed some shortcut software on the computer. Now when I type certain keys, unwanted medical words automatically pop up. Typing M will bring up medial, D brings up distal, etc. I actually end up using the back space key more than any other keys on that computer. Challenge #4- My computer also recently got some kind of virus that pops up an error message every 15 seconds but you can't delete the messages so you just have to drag it down out of sight towards the bottom of the screen. I loved those. I think there are about 50 of them just sitting down there. If you enjoy the victim mentality than you probably pity my poor computer equipment and skills. If you are a problem solver you are probably disgusted that I have not corrected such simple problems by now. Either way I just want you to know of the adversity I deal with each time I submit a post. Apparently there are some forces at work that don't want me to blog. I go through phases with what I listen to while driving in my car. I am always cycling between popular music, talk radio, educational tapes, and news. A couple weeks ago I just couldn't take any more news about bailouts and the economy so I switched the station to classical music. I was listening to the Sorcerers Apprentice by Paul Dukas and it brought back images of Mickey Mouse mopping up water. After listening to several other pieces I started to get fidgety because I was having withdrawals from negative news and obnoxious commercials. I wanted so badly to return like a dog to his vomit to all the noisy commercialized stuff I had been listening to for months but I didn't. It has now been several weeks of consistent listening and it has been a positive change. I am less stressed and I can actually think my own thoughts when I'm driving around. Many people don't relate to classical music or they feel intimidated by it. I'll admit it is more complicated than pop music. Instead of saying "That was War by U2", a classical announcer says something like "You just heard Felix Mendelssohn's Octet for strings in E-flat major performed by the Academy of St. Martin in the Fields Chamber Ensemble." Don't let all those details intimidate you. I don't know what it means either. This reminds me of an episode of M.A.S.H. when Radar was trying to figure out how to fit in with intellectuals and come across as being cultured. He didn't know anything about classical music so Hawkeye coached him to say "Ah Bach" whenever the topic came up so it would sound like he was familiar with it. "Ah Bach" has been a favorite quote of mine ever since then. Just in case you are questioning my credentials, When I was in grade school, I played the trumpet for 5 months, the piano for nearly 6 weeks, and I almost started the drums so I'm pretty much an expert on music. I consider my music tastes to be well rounded. I like all kinds of music, especially rock. I enjoy RUSH and occasionally even some Van Halen and AC/DC, so it's not like I'm a myopic classical music enthusiast. Below I have listed just a few of my favorite pieces and composers. If you aren't a big fan you should give some of these a listen sometime. I think you would like them. Even people who say they don't know anything about classical music will recognize and enjoy many pieces from movie sound tracks. Disclaimer-Although I'm promoting classical music, I'm not talking about opera. Opera is the ridiculous result that occurs when heavy set Prima Donnas in a costumes sing along to classical music and ruin it. Mozart-All of his music is fun to listen to because I imagine Saliere fuming in the background. Beethoven-5th Symphony, Ode to Joy, and his Violin conerto. Ravel- Bolero (This concept is what many pop songs are based on today. Oh la la baby... repeated 27 times) It's monotonous but a classic. I also enjoy Palestrina, Berlioz, Hayden, Shostakovich, Tchaikovsky, Brahms, St. Saens, Chopin, Rachmaninoff, and many others. And I couldn't forget Bach-Ahh Bach! PS-There are many "real" music scholars who I'm sure are shaking their heads in disgust since I have only highlighted "popular" works that the masses fall for. I'm sure they would recommend some dissonant sounding contemporary piece composed by an obscure Eastern European artist, but that's their problem. At least I left the Pachelbel Canon off the list. I'd like like to make a brief clarification about my last post. Despite being busy and feeling overwhelmed, I will continue to blog like a mad man. Blogging is extremely therapeutic and it costs a lot less than traditional therapy. I was just trying to cut myself some slack so I'd have an excuse in case I produce a sub par post. In the past I have intentionally kept my kids out of this blog, but I am making a brief exception today. I was recently looking through some pictures that I had taken on my cell phone and I came across one that I had forgotten about. One day my son Josh got bored so he went into my bathroom closet and got my electric razor out and decided to give himself a haircut. He had seen me give my boys haircuts for years so he new it couldn't be that hard. He turned it on, popped open the side burn trimmer and started to rub it on head. I'm sure he was feeling pretty good about his new barber skills until an older sibling saw him and screamed in horror. 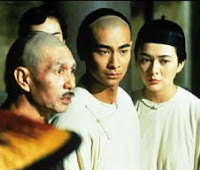 As you can see from the picture below, there is not a lot you can do to salvage this type of haircut unless your kid is a Jet Li fan or wants to be a Shaolin Monk. This picture brought back memories of all the "kid haircuts" I've seen during my life. Usually the bangs are the hardest hit area. I'm sure you've all seen similar pictures in school pictures or family photo albums. 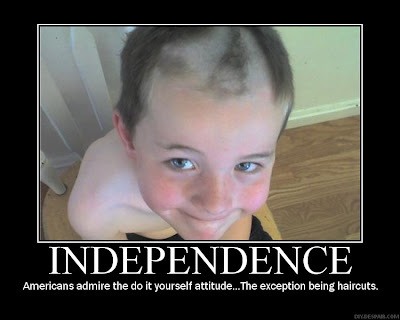 You gotta love it when a little kid takes the initiative to keep their hair trimmed. The more I think about it, I have to admit it's actually pretty cool that kids have enough confidence to attempt a haircut and are not afraid to try. What I originally thought would be a just a funny picture actually has some deep meaning to it. If you don't feel ready or qualified to do something or if you are intimidated by some sort of task or project that you are supposed to do, just follow the example of Josh and get to work on it. Someone can always help you clean up your mess later on. In January of this year I enrolled back in college nearly 16 years after I attended my last class. I was just two semesters short of graduating when I quit school. It wasn't really a rebellious thing when I left. I didn't leave angry and beat up my teachers on the way out like you'd see in a Twisted Sister video. It was just the stress of competing with starting a family, getting a job, and jumping into the real world. Since starting school again I have felt a little out of place with so many younger classmates and even felt like Rodney Dangerfield in Back to School on a few occasions. One of my professors is younger than me. I'm envious of the younger students who spend all day on campus studying and that is all they have to focus on. The hardest part for me has been trying to fit in 15.5 credit hours of classes while working full time. With the exception of one class I take during my lunch break I have not been unable to attend any of my classes more than a couple times a month. Now that's a recipe for good grades! I had a rude awakening recently when I took my first official test of the semester. I took it in the testing center and I knew things were bad when they fed the bubble sheet with my answers into the reader machine that grades it and instead of giving a score it just made the noise that Pac Man makes when he dies. Being in school has made it difficult to keep up on my blogs. The Movie Guy and Healthy Chaka have been neglected and I've only been able to post on them about once a week. Speaking of neglect, I also have a family. I am trying to manage three blogs while working full time and in school. For a blogger that is equivalent to being a single mom and working two jobs. If you are a single mom working to jobs I didn't mean to insult you by comparing my blogging difficulties to your plight. Last week I went to a movie review blog I have visited in the past and it just said "Going through some stuff". That was the last post over two weeks ago. Sometimes I am tempted to post a similar message and just head down to Cabo for a week, but then I remember that the show must go on... and I have no money to do so even if I wanted to. So if you see a decline in productivity, creativity, or humor just know that my posts should get better mid April when the semester is over. I am dedicating this post to all the serious bloggers out there. It has been fun to get to know people via their blogs. I feel I know many of you even though we have never met in "real life". Coincidentally that's also what stalkers say about their victims. I've noticed that many of the prolific bloggers have common friends and follow many of the same blogs. I have actually been quite impressed with the overall respect, good manners, and camaraderie I have witnessed among them. I have seen how friendships are made as these bloggers share kind words and are quite supportive of one another. Despite all warm fuzzies that I've observed, I can also see some potential for offending others and creating cliques in the blogosphere. For instance, someone might feel shortchanged that they were not awarded a button and so they become jealous. Others might be offended by a post. Perhaps someone chooses to promote or follow a friend's blog but the favor is never returned. There are a ton of ways this could happen. You get the idea. I would never want to see a division or things get ugly among friends but if it ever did, this is how I see it happening. Let's just hypothetically say that two blogger friends had a misunderstanding so they stopped commenting and following each others blogs. What if things got kind of nasty and it escalated to the point where they started blogging smack about each other. Who's side would you take if they were both your friends? What alliances would be formed? Not only does this sounds kind of like girls in Jr. High, but it is also how I predict World War 3 will start. Again, hypothetically, let's just imagine if someone had publicly offended Sass. I'm sure Scope would stand up for her. Cora and Morgan would probably be ready to join the cause and help and I'm sure Cow Guy would rally behind them too. On the other hand what if others thought Zibbs was under attack. I'll bet Gwen would step in, as would Jeanne. I'm guessing Candy and Gilligan would also bring their muscle to the table. Pretty soon it would start to resemble X-Men since you'd have two groups of talented and skilled superbloggers battling against one another. Just imagine the excitement as the individual personalities used their talents and blogging skills (super powers) against each other. I can even imagine what their costumes would look like. Blogger friends pitted against each other would be as tragic as the Civil War with brother fighting against brother and father against son. No, even worse. Like an episode of Star Trek where Kirk and Spock are forced to fight each other to the death . Who's side would I join? I'd probably pull a Switzerland since I like them all so much. Fortunately this nightmarish situation doesn't ever have to take place. Now that you have visualized how terrible this scenario would be I hope you feel like Ebenezer Scrooge waking up after a night of bad dreams. God bless us, everyone. PS-The above mentioned names are fictitious. Any resemblance to actual bloggers who happen to have those same names and links is purely a coincidence. PSS-If I didn't mention you in this post don't form an alliance against me. I am always looking for ways to improve my blog. I don't have the most extensive vocabulary, but luckily I found a thesaurus yesterday. I happened upon this pragmatic lexicon inadvertently. It has bolstered my diminutive jargon by contributing a plethora of choices and has enhanced my phraseology. Those who habitually frequent this blog will do so with greater periodicity now that I can implement more sophisticated colloquy. Historically my intimations have been enigmatic and perplexing, but with the aid of this compendium my lucid communiques will now influence both proletariat and aristocracy alike. So, maybe that's not the magic solution to my blogging problems after all, but if any of you have any suggestions of what you'd like to see more or less of at Chaka's World feel free to let me know. When I was a kid my parents had a copy of The Physicians Desk Reference. This is a book that looks like a large encyclopedia or dictionary until you open it up. Most of the book is comprised of information on a variety of health conditions and diseases. It includes summaries, diagrams, and flow charts for diagnosing illness, but the best parts of this book are the pictures. As little kids we would flip through the pages and it was almost like playing Russian Roulette because you never knew when you'd turn the page and see a disgusting picture. There were plenty of nasty pictures throughout the book, but one that stood out and became our favorite was an ailment known as "black hairy tongue". Black hairy tongue is a real condition (lingua villosa nigra) where the papillae of the tongue t urn black and a hair of fur like appearance is created due to the growth of bacteria, yeast, or fungus. I was going to include a collage of images, but I thought I'd spare you. If you are hungry for more just google it and you can see all the images you want. It is a harmless condition (unless you are asking someone out on a date) and some of the things that can cause it are: poor oral hygiene, drinking excessive coffee or tea, chemotherapy, medications that contain bismuth like Pepto Bismol, and tobacco use. Of course the biggest cause is from not regularly reading my blog. As of today there have been no cases of black hairy tongue reported by any of my followers. Science would support that this is an obvious cause and effect scenario and it appears that I have the antidote to this malady. The Physicians Desk Reference can be a very helpful and informative book, but it is danger ous if you are weak minded and susceptible to suggestion. I can't tell you how many times I thought I had the symptoms for scarlet fever, rabies, heart murmur, and leukemia by just reading through the symptom checker. Maybe I'm just weak minded like the poor storm trooper who was told "these are not the droids you are looking for" by Obi Wan. Anyway I have tried to stay away from the book because the last thing I need is to turn into a hypochondriac. That being said, I'm not even sure how I ended up with this book after all these years. I think my parents got a newer version and gave me their old one. Today I see my kids huddle around this book and turn the pages and pull faces in disgust. It's now a third generation family tradition and some day this timeless treasure will be passed on to one of their families. I'm sure my kids are already scheming about who will inherit it after I'm gone. Sorry to be short but I have to go brush my teeth. Today I was notified about a blogging contest that Barking Mad is sponsoring and they are offering a big time prize to the winner. It's a $250 Target gift card. That's pretty exciting since $250 earned from blogging is equivalent to about $2,500 in real world income. The contest rules are simple. You create a post with a link to Barking Mad. Then just add links to your top 10 favorite posts. So there you have it. I hope the judges are merciful and I just want them to know that all of my favorite foods are made by Archer Farms. I'm also hoping this works out better than the last contest I did that involved helping the recently deposed Prime Minister of Nigeria with some banking assistance. I don't have much time for this post but I'd like to dedicate it to one of the most amazing substances on earth: Lava. It is a paradox how something so hot could be so cool. Lava is awesome because it is so enticing and mesmerizing yet so dangerous. It's like playing with fire, literally. 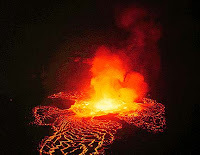 Just saying the words "molten magma" conjures up images of power, beauty, blistering heat, and Dr. Evil. Lava has also provided a supporting role in many movies like: Dante's Peak, Volcano, Lord of the Rings, Indiana Jones and the Temple of Doom, The Incredibles, and Star Wars: Revenge of the Sith. 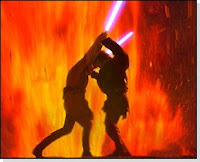 The only thing that could make lava even cooler would be if you added light sabers to it. Let me finish by saying despite it's bad guy image, lava brightens up my life. It has my respect. If lava were a blogger you can bet I'd be a follower. I lava it. This post was sponsored by the Lava Foundation and the Ad Council.